Question: Explain how we would use work measurement data in garment costing. ... asked by Nishani Snajana. Time study data is known as work measurement data. From time study we calculate standard time (SAM) for various activities. In garment production jobs are called as operations. 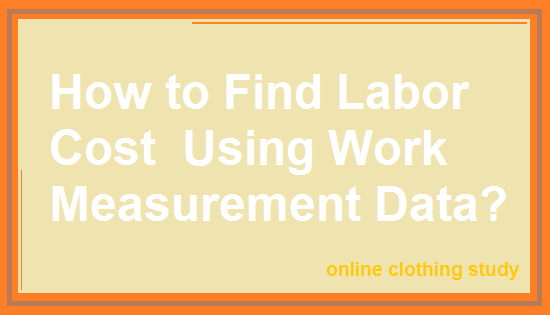 Using work measurement data you can estimate only direct labor cost of garment making. Other cost parts of the total garment cost such as factory overheads and material costs need to be calculated separately. Here I will show you how to use work measurement data to find labor cost. Please note cutting cost and finishing labor cost have not been included here. These costs are considered as factory overheads. I am not saying that you can’t measure work content of cutting and finishing operations. You can also measure direct labor cost for these sections. First, calculate garment sewing wok content in standard minutes. You can use Time Study method or synthetic data for calculating standard minute of the garment sample. So, you know how to get garment sewing SAM. Calculate minimum labor wages of your region or check with your human resource (HR) department for daily wages of skilled labors (sewing operators). From the daily wages, calculate per minute labor cost. Calculated per minute labor cost is 4.0/480 = USD 0.00833. Calculate line efficiency of your sewing lines. If you know the efficiency of your sewing lines, use those data. Let's say one line is running at 50% efficiency. We will use this data for labor cost calculation. Example: Let's say your product SAM is 20 minutes. Line efficiency and Labor wages of skilled labors are as the above. Online Clothing Study: How to Find Labor Cost for Garment Manufacturing Using Work Measurement Data? Direct labor cost calculation method from garment SAM.